After a couple of days of nasty weather, I thought it might be worth posting a little sunshine. Hawaiian sunshine with a little bit of Jagoffery. guess this guy didn’t want to bother with a tarp.. yes, that is a lawn mower hanging out of the back.. I utilized the “Jay Caulfield Approved Jagoffestrator” to highlight the lawn mower. You’re welcome! But wait! Maybe we are all being too judgmental. Remember those urban legend stories about a dead scuba diver being found at a forest fire? Supposedly the body was fully clad in a wetsuit complete with scuba tanks and mask and the story is told that a scuba diver was accidentally scooped up in an air tanker with a load of water from the local ocean/lake. 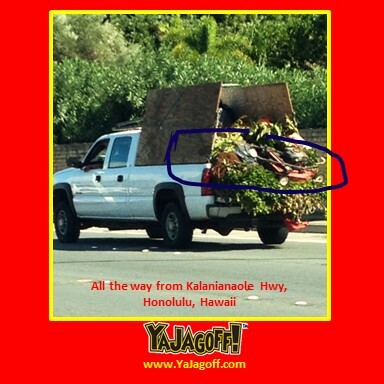 We put the SJU (Special Jagoffs Unit) on this task and, their premise was, POTENTIALLY, there was an over-sized bull dozer, digging at a major site, that somehow scooped up an unsuspecting grass cutter who was mowing some big weeds along the side of a Hawaiian Highway, accidentally scooped up and dumped into the back of this pickup truck. Where his body is, we are not sure. Perhaps he/she is napping in the back of the truck OR perhaps he/she has gone off to scuba dive and, potentially at risk of getting picked up by a helicopter and thrown on top of a forest fire. Or maybe this is a mobile landscaping exhibit where they are trying to show you that new kind of lawn mower than can cut your hillside conveniently! Other than that, there seems to be ZERO explanation for this. My guess is this truck doesn’t need a “Keep Back 500 Feet” sign since, I’m fairly certain there’s nobody tail-gating him with that precariously placed mower. Hey Fred Sanford, Jr, Jr, Jr, (yes, a distant relative) you might be able to stop working so hard for a living. Do this: enter that lawn mower into the cirque du soleil performances, it’s balancing ability is incredible and you’ll get RICH other than SUED when that thing falls off your truck, Ya Jagoff! Mahalo to @Libbunnie on Twitter and Instagram for submitting this pic and being our Honorary Jagoff Catcher. Previous articleGun Goes Off at Giant Eagle. What’s the REAL Crime?